We recently caught up with one of our favorite clients, Minna Taylor from Energize Your Voice, to discuss her decision to rebrand her company last year. Energize Your Voice offers communication coaching and experiential training sessions in professional development that playfully explore the art of storytelling and public speaking. Minna started her business 2.5 years ago. She'd been coaching for awhile on her own while auditioning for acting roles. After booking a commercial acting job, she decided to take the opportunity to pivot in her career and dive head-on into a new role as founder of her own company. Minna's background in theater and extensive acting training make her the perfect coach for those working to find their voice. As soon as Minna started Energize Your Voice, she knew she would need some branding help. The first version of her logo and website came from a designer in South Carolina. "We went through about a million iterations on the logo," recalls Minna. "I knew I wanted it to look both urban and organic, to symbolize the idea that we have to root in order to grow." "My first logo had an attitude but no brand," remembers Minna. "It required explanation and it was neither modern nor intuitive. The aesthetic was obtuse and the content on the website was too verbose." My first logo had an attitude but no brand. Energize Your Voice retained that branding until 2016, when Minna met Carlos through a Business Networking International event. She'd reached a point where her vision had become more streamlined and she was gaining the attention of more elevated clients. "I spoke with Carlos and we discussed that Energize Your Voice needed to elevate its branding in order to appeal to corporations, not just individuals," Minna recounts. "I had this sense of momentum. It didn't feel urgent or overwhelming, but I knew growth was going to happen. I wanted to rebrand before I had to do it. I was approaching the point where I was going to feel embarrassed by my old branding. I could feel the next phase coming and I wanted everything to be aligned." DBC got to work and created a drastically different logo and website for Energize Your Voice. "I loved the visual impact of the new logo," says Minna. 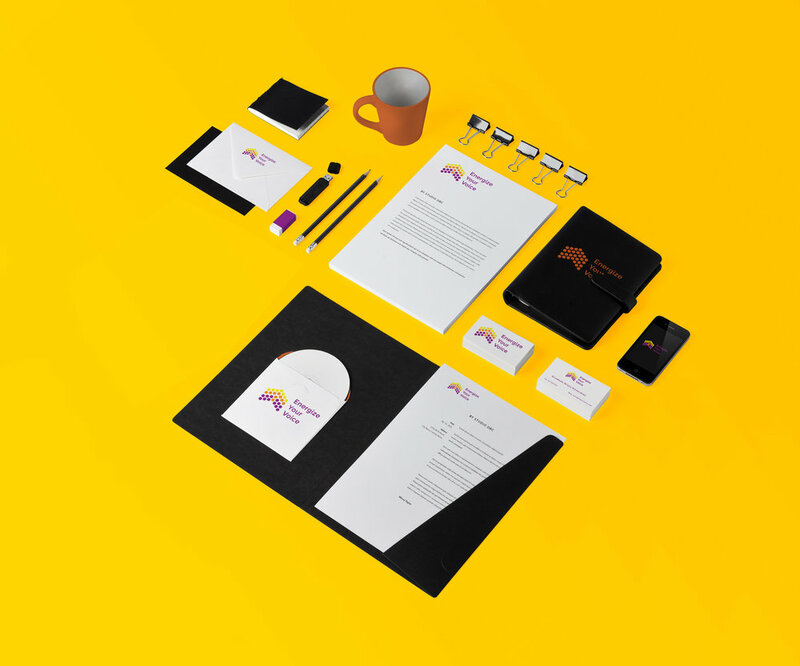 "We talked about how to take the round elements of the brand and use them on promotional items, marketing assets, and throughout the website." "Now my brand is about color—it's about being vibrant and energetic," says Minna. "The rebranding process even affected the way i dress at workshops. Carlos came to a class I was leading. I'd dressed in all black. He mentioned that my brand was all about color and that as an ambassador for my company, I can reflect my branding in the colors I wear." Now my brand is about color—it's about being vibrant and energetic. Minna says the company's new branding has really changed the way she feel and speaks about her business. "Before I had to kind of apologize for the branding because it wasn't as mature. After the rebrand, I've felt so much more confident reaching out to people. I can't wait to send them to my website." Energize Your Voice is continuing to grow, pursuing thought leaders and innovators. They're expanding beyond New York City to include a conference in Berlin and new opportunities in Charleston. Even as the company engages with a higher level of clientele, Minna feels confident that her new branding will continue to work well for her and reflect her company's values. "This branding is both mature and playful. It feels timeless." Like Minna, we know that Rebranding can be tough. But you don't have to fear much longer! At DBC, we’ve developed a free guide to rebranding that will help you find the answers you need before you commit to the proccess. You can get your copy of The Rebrand Plan here. Print multiple copies and distribute it to your team. The answers will help you assemble a clearer picture of how the rebrand process can work for you.